This was shot using a Canon EOS 5D Mk II, EF 24-105 f/4L IS USM, no-name tripod, Hoya UV-Filter. ISO800; 51s @ f/4,5; The light inside the car is from a led-flashlight used by one of the other passengers. 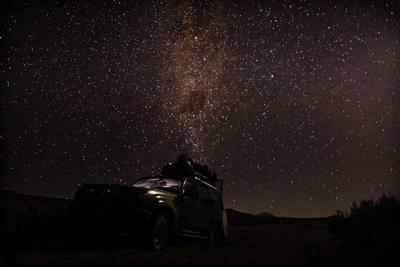 On a trip around the world we were travelling by car from Atacama desert towards the salt flats of Uyuni, Bolivia. After taking a detour of three hours at an altitude of more than 13.000ft, we decided to return to lower grounds, when our car got stuck in the sand beside the piste. After desperately trying to get out of the sand without proper equipment (or skill) our driver left to get help from a village a 30min car-drive back. While night began to progress and mood in the car worsened, I decided to get out and take some night shots. After approx. two hours in the sand our driver returned with help and after another half hour we were finally back on-piste. Other things to happen afterwards: flat tire, spare tire with non-matching rim-diameter and the almost-loss of the same tire due to not properly tightened nuts. The shot was taken on the 24th of August 2009, 8:24pm. Some minor cropping and adjustments were done in Adobe Lightroom 2. I like the angle you've chosen because it involves the car, with the lights on inside the car somehow reflecting the stars and adding a lot to the atmosphere of the photo. Well done.